Preheat oven to 375 degrees. Bring a large pot of salted water to a boil. Prepare peppers by using a small paring knife to cut around the top of the bell peppers in a full circle, leaving the stems attached. Remove the white ribs of the peppers and any seeds left inside. 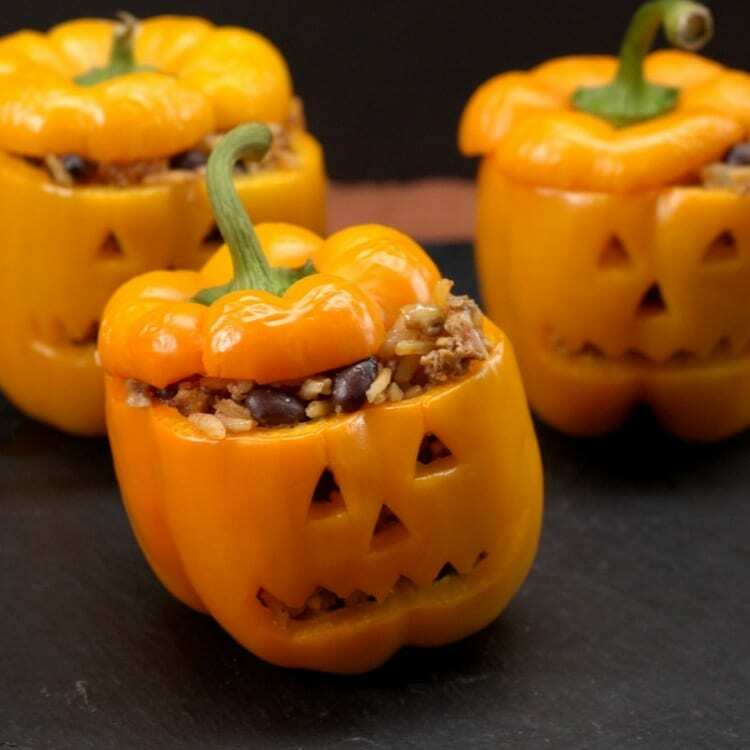 Using the knife, cut out a jack-o-lantern face on each pepper. When the water reaches a boil, put the peppers into the water and cook for about 5 minutes. Once slightly tender, remove peppers and set aside to cool. In a saute pan on medium heat, add butter, diced onion, and salt. Cook until translucent. Add the rice until the rice smells and turns a light golden color and onions are slightly caramelized. Add the ground turkey and taco seasoning and cook until meat is no longer pink. Add tomatoes and 1 1/4 cups of water and bring to a boil. Cover the pan and reduce the heat to low allowing a gentle simmer for 10 minutes. Fluff the rice with a fork and mix in the black beans and shredded cheese once the rice has cooled. Fill each pepper with rice mixture and top with the lids. Bake the peppers for 15 minutes, or until the cheese has melted. Enjoy!